Did you know that Captain Sams Inlet, which separates Seabrook and Kiawah Islands, is one of the few places in the United States where residents and visitors can regularly see dolphins engage in a unique hunting behavior called "strand feeding?" Strand feeding occurs when Atlantic Bottlenose Dolphins (Tursiops truncatus) work together in small groups to herd fish towards the shallow water and shore. They then use a powerful wave to push the fish onto the shore. Finally, the dolphins lunge their bodies out of the water and onto the shore to eat the fish. Giving dolphins sufficient space while strand feeding is important minimize harassment and ensure that this unique behavior is not disrupted. 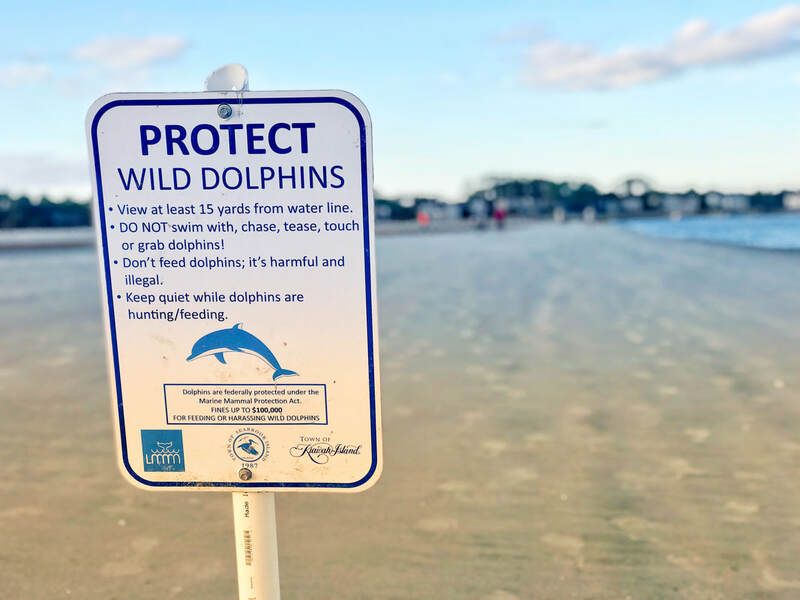 ​The Seabrook Island Dolphin Education Program is a field-based program designed to engage and educate beachgoers while reducing human disturbances to the local dolphin population. The program is managed by the Lowcountry Marine Mammal Network (LMMN), under contract with the Town of Seabrook Island, and relies on the support of citizen volunteers. Educators are present at Captain Sams Inlet each day during the peak tourist season to interact with beachgoers and collect valuable data about strand feeding activities. LMMN coordinates a similar program in the Town of Kiawah Island. ​During the inaugural 2018 season, program volunteers were present for more than 150 shifts between April and September, and provided more than 600 hours of coverage on the beach. During that period, educators interacted with over 1,400 beachgoers, with more than 90% of these interactions being rated positively. During the 2018 season, there were no reportable disturbances. Educators also identified and tracked the behavior of 11 individual dolphins, including one new calf. ​Interested in volunteering with the Town of Seabrook Island's Dolphin Education program? Please contact LMMN by email at info@lowcountrymarinemammalnetwork.org or by phone at (843) 991-6953 for more information. ​Harassing or disturbing strand feeding dolphins not only threatens the continued occurrence of this rare behavior; it’s also a violation of the U.S. Marine Mammal Protection Act! Do not stand closer than 15 yards from the water’s edge. Do not enter the water, swim with, chase, tease, touch or grab the dolphins. If you are in a boat or kayak, do not come within 50 yards of the dolphins. Do not touch, feed, or encourage dolphins to approach you or your boat. If dolphins approach you, do not chase, follow or encircle them. Never approach or separate a mother and her calf. Keep quiet while dolphins are hunting or feeding. ALWAYS remove all trash and garbage from the beach. Marine mammals will confuse trash for food and ingest foreign objects, resulting in illness and death. Harassing, feeding, or attempting to feed dolphins is a federal crime punishable by fines of up to $100,000 and up to one year in prison. Any harassment of dolphins should be reported to the Seabrook Island Beach Patrol at (843) 718-6083 or the NOAA Fisheries Law Enforcement Office at (800) 853-1964.